Wy's Original provides award-winning, mouth-watering, gourmet sauces for wings, beef, and all-around purposes! Wy’s Wings Original Wings Sauces boasts a line of Wing Sauces that have beaten the best and most well-known Wings establishments in Buffalo, in actual competitions, as well as other competitions, as you can see here. 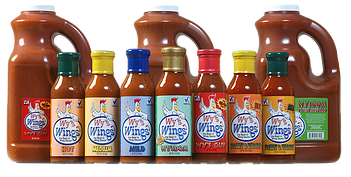 Wy's Wings features a line of traditional Buffalo Wing Sauces and also offers a variety of Sauces that can be used as sauces for other purposes such as well such as Marinades, Condiments, and Finishing sauces, BBQ-ing, Stir-Fry, Dipping, for making Dressings, and much more. Wy’s Original Sauces offers SAUCE IT ALL® (A Gourmet, All-Natural, All-Purpose Sauce), as well as a full line of other sauces to satisfy every palate! Our newest sauce, Wy’s Burger & Steak Sauce, is now on the market and getting rave reviews! We invite you to learn more about our products and experience the taste sensation for yourself and your customers!